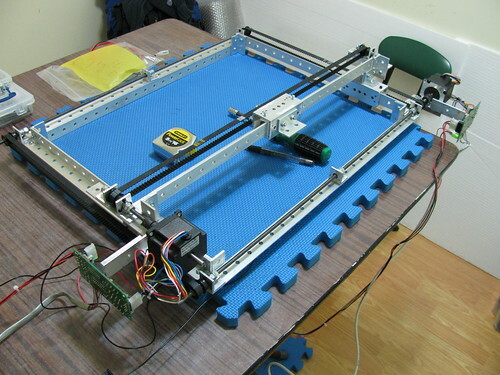 This is a simple belt driven XY plotter using sliding elements for both X and Y axes. It can move relatively fast, 300-400 IPM (130-170 mm/s). The Y axes sliding elements are driven independently which allows larger X spans without loss of accuracy. Axis travel: X17" / Y11". Assembly time: approx 2-3 hrs. Original version has accuracy issues due to backlash in jaw motor coupling. Angle-24 can be fabricated using Angle Indexer. Drill 1+1 holes on each end (4 in total) in each angle-24.